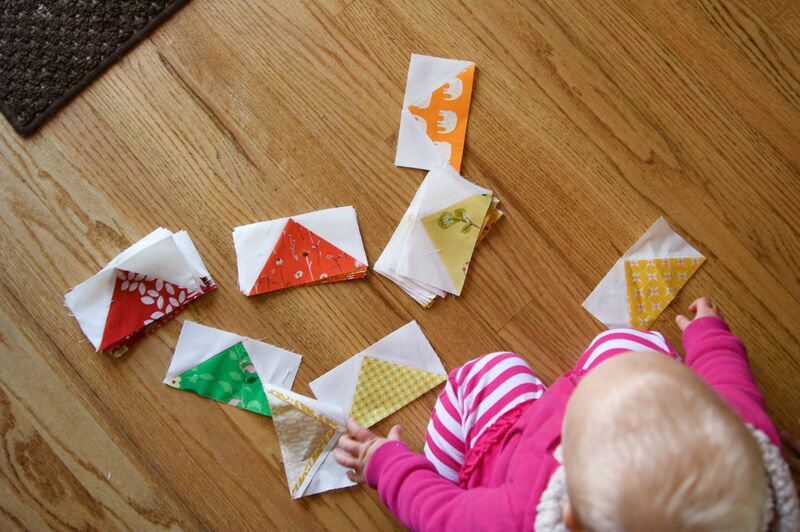 Linking up with freshly pieced again today, sharing another baby quilt I started this week. I've had this idea on my list of to-do's for a long time. I am really into rainbow themes right now, and I always love flying geese, so I am putting them together in one quilt. I'm getting excited to see it. I underestimated how many geese I would need (guessing never works) so I am back to cutting again. Someday I'll use the old adage, measure twice, cut once. I just get too excited to get started and don't want to spend time figuring things out. What a pretty stack of fabrics! Sounds like a very fun project. 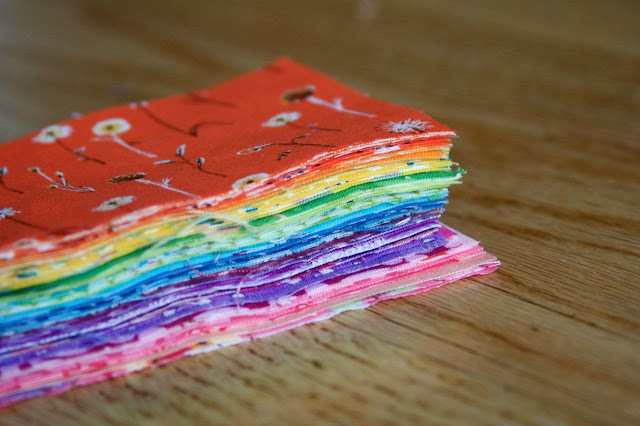 We're doing a rainbow quilt-along at my blog right now. It must be rainbow season! I do the same thing, not measuring and having to go back and cut more. Do you think we will ever learn??? very nice. I do not always do my math either. luckily I end up with more then needed. I never ever check the amounts I need when I start cutting. I usually end up short, and have to go through another round of cutting and piecing. I hate having leftover pieced fabric though, so I guess it works! Very pretty, it will be a gorgeous quilt! I can't wait to see how your quilt comes together. Those geese are so pretty! Oh, that is going to be one lovely baby quilt! I look forward to seeing progress. Thanks for the inspiration! That is going to be a beautiful quilt! such a sweet picture. and the geese are lovely! oooh! it looks really cute. i've been thinking of a rainbow quilt for a while too. one of these days . . .
absolutely delightful!! i love all the bright and cheery colors!! a flying geese quilt is on my list too!! I never cut enough the first time around ;) Looks beautiful so far! oh, where's the fun in measuring?! is that heather ross's new floral in orange for spoonflower on top? my order hasn't come yet. Fabulous! Can't wait to see all your rainbow geese. Thanks for linking up with WIP Wednesday, have a lovely week. I love seeing the colours lined up together. Geese is my next thing to attempt! Thank you for share your extremely superior informations. It's great! I am impressed by the material that you have on this blog. It exhibits how nicely you comprehend this topic. Your web page is one of my new preferred. So maintain up the excellent work! Hey, I happened upon your blog this morning and found you live in Denver, me too! You have gorgeous fabric, and I'm assuming you order it online, but I'm wondering if there are any local shops you like. All of the quilt shops I've been to are carrying very dated fabric. 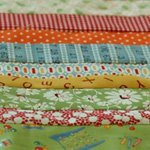 hi mindelicious, I do order a lot of my fabric online, but a new shop opened in my area (Littleton/centennial), Snappy Quilts, and it's got great stuff. Check it out. There is also Fancy Tiger, it's closer to downtown, and they have cute stuff too.